Wildlife and Fisheries Branch protects and manages habitat on Crown lands designated as Wildlife Management Areas. Wildlife Management Areas conserve biodiversity and contribute to Manitoba's Network of Protected Areas, while also providing opportunities for hunting, trapping, wildlife viewing and interpretation. Special Conservation Areas protect critical habitats for endangered species, such as piping plovers, from disturbance during the nesting and brood rearing season. The Branch also encourages the conservation of critical wildlife habitat on private lands through a variety of initiatives and cooperates with other conservation organizations, such as The Manitoba Habitat Heritage Corporation, The Nature Conservancy of Canada, Ducks Unlimited Canada and other partners. The Critical Wildlife Habitat Program (CWHP) is a cost-shared initiative involving Manitoba Sustainable Development (Wildlife and Fisheries Branch), the Manitoba Habitat Heritage Corporation and a variety of other agencies, which are involved on a project specific basis. Funding is also provided by the federal Habitat Stewardship Program for Species at Risk (HSP). The CWHP goal is to identify, conserve and manage remaining native grasslands and the rare and endangered species these habitats support. Mixed grass prairie once covered approximately 24 million hectares in Canada from Alberta to southwestern Manitoba. Mixed grass prairie occurs in areas that receive between 25 and 50 cm of precipitation annually and where soils are sandy or well drained. Typical species include grasses such as little bluestem (Schizachyrium scoparium), needle and thread grass (Hesperostipa comata), blue grama (Bouteloua gracilis) and wildflowers such as prairie crocus (Anemone patens), dotted blazingstar (Liatris punctata), and lily (Lilium philadelphicum). Species at Risk in the mixed grass prairie include: Small white lady's slipper (Cypripedium candidum); Baird's Sparrow (Ammodramus bairdii); Burrowing Owl (Athene cunicularia); Loggerhead Shrike (Lanius ludovicanus); ; and Ferruginous Hawk (Buteo regalis). Today less than 25 per cent of mixed grass prairie remains in Canada, generally in areas unsuitable for cultivation. The reasons to save native mixed grass prairie are many and varied. It is home to a wide variety of plants and animals, some that are commonplace and others that are rare. Species like sharp-tailed grouse and deer are frequently observed but some, such as small white lady's slippers and burrowing owls, are seen only by a lucky few. Native prairies and the species in them are often useful, economically and scientifically. No one knows what value prairie species may hold for future crops, medicines and other products. Native mixed-grass prairie is a living museum brimming with beauty and untapped information, a rich natural heritage for all Manitobans. The Mixed-grass Prairie Stewardship Project, under the CWHP, promotes agricultural activities and prairie management that incorporate wise land stewardship and biodiversity conservation . This project raises landowner awareness of the value of native grasslands and guides future management and stewardship activities by providing inventory information to focus conservation efforts. The project implements, monitors and evaluates sustainable prairie management techniques such as managed grazing, burning, brush mowing and invasive species control. 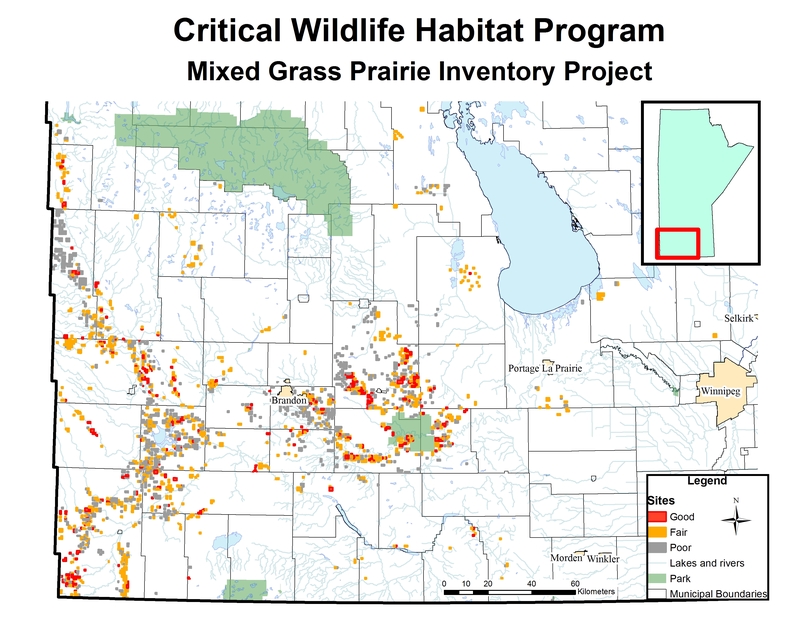 The CWHP has also embarked on an inventory to identify and rank the remaining areas of mixed grass prairie in Manitoba. Prairie is graded from "A" to "D." A grade of "C" or higher indicates a good quality community with the potential to improve over time. A grade of "D" indicates poor quality sites that require extensive management to improve. From 1989 to 2016, 199,000 ha have been inventoried, with approximately 60 per cent considered in good condition, grade of "C" or higher. Four major threats to Manitoba's mixed grass prairie were identified: cultivation, trembling aspen (Populus tremuloides) encroachment, exotic species invasion and inappropriate grazing management. This CWHP project is delivered in the Tall Grass Prairie Preserve area of southeastern Manitoba. This area is the largest intact natural tall-grass community in the province and contains several endangered and threatened species. Through a multi-agency partnership, the Tall Grass Prairie Preserve Management Committee develops an annual work program that focuses management efforts for the area. The goal of this project is to ensure that the management done at the Preserve is effective in maintaining ecosystem viability as demonstrated through monitoring, and that the monitoring program is tracking the impacts of all major local and landscape-scale threats to species at risk. Before the arrival of European settlers, the Red River Valley in south-central Manitoba was a vast sea of tall-grass prairie, a complex ecosystem with an astonishing variety of grasses, flowers and wildlife. Dominated by grasses that reached over two metres in height, this was the most productive type of prairie in North America. The very richness of the tall-grass prairie, however, spelled its doom. With deep fertile soils the colour of coal, the prairie was soon transformed by settlers. Cereal and forage crops are now cultivated where orchids, lilies, and grasses once thrived. Tall-grass prairie in Manitoba is only a fraction (less than 1%) of its former 6,000 square kilometres. In 1987, several years after the International Biological Programme conducted a search for natural areas, Nature Manitoba (formerly known as the Manitoba Naturalists Society) launched a systematic survey to locate the surviving remnants of this beautiful landscape. Only a few sites were discovered and many were less than a hectare in size. The largest tracts of tall-grass prairie were found near the towns of Tolstoi and Gardenton in southeastern Manitoba. In 1989, the Critical Wildlife Habitat Program, a cooperative program involving seven conservation organizations, began securing lands in the Tolstoi-Gardenton area for a prairie preserve. Today, over 5,800 hectares of tall-grass prairie are protected within this Preserve. Like many remnant grasslands, the lands within the Manitoba Tall Grass Prairie Preserve escaped destruction because the land was too difficult to plough. Large boulders, aspen groves and far-reaching swamps discouraged the early settlers in turning the precious sod, allowing this unique plant and animal system to endure. Today, the area is home to over 460 plant species, from flowers and grasses to shrubs and trees, and a variety of animals from butterflies, frogs and songbirds to voles, deer and an occasional bear. From April's first growth to October's killing frost, the Preserve is in constant metamorphosis, its colour, contour and fragrance changing from week to week. Even before the snow is gone, the area begins to teem with life. Boreal chorus frogs call for mates from grassy ponds and the trill of a western meadowlark announces to one and all that spring is here to stay. Amid the brown of last year's growth, the first shoots of pale green emerge, delighting those who stop to investigate. Soon, the delicate flowers of yellow star-grass and early blue violets appear, followed by flowers in every imaginable shade and colour. The blossoms of golden alexander, prairie smoke, blue-eyed grass and the medicinal seneca root carpet the landscape. In May, the moccasin-shaped flowers of the endangered small white lady's slipper appear briefly in the tangle of greenery and then all but disappear as other plants follow in the never-ending succession of colour. Birds of many kinds fly and soar above the preserve. Over 120 species of birds nest in the nooks and crannies of the Preserve. The trumpeting call of a nesting sandhill crane can be heard from a distance while the soft tapping of the yellow rail eludes all but the keenest listeners. In July, the rare and enchanting western prairie fringed orchid blooms. Purple and white prairie clovers lend contrasting colours to the prairie while enriching the soil with nitrogen. The composites begin their showy displays from black-eyed susans to blazing stars and the early goldenrods. The sight of the native prairie at the height of the blooming season is a never-to-be forgotten experience. This is when the greatest diversity of butterflies can be sighted -- 20 or more kinds on a good day -- including the rare Powesheik skipper, a species found only in the Preserve area within Canada. In August, the prairie is aglow with expanses of golden Indian grass, prairie cord grass, prairie dropseed and big bluestem. Hidden among the grasses are rare orchids: hooded ladies'-tresses bloom in early August while Great Plains ladies'-tresses flower a few weeks later. The blossoming of the gentians herald the start of autumn; the flowering of the closed gentian is one of the last colourful events on the prairie, often blooming until the harshest frosts. Soon the monarch butterflies will begin their fall migration to the southern United States and Mexico as yet another magical prairie season passes. Since the tall-grass prairie is an endangered ecosystem, some of the associated plants and animals are also scarce. The western prairie fringed-orchid (Platanthera praeclara) is an endangered orchid found in the north block of the Prairie Preserve. It grows in remnant native prairies and wet meadows in the United States and Canada. In a peak year more than 9,000 flowering stems may be observed while fewer than 4,000 are produced in other years; remarkably, this is the only Canadian location of this plant. The western prairie fringed-orchid is a sturdy, long-lived perennial with creamy-white to white flowers in a cluster 25 centimetres or more in height. The lower petal of each flower is delicately fringed. Blooming generally begins in early-July and lasts for three weeks. Sphinx moths play an important role in pollinating the orchids. These orchids require a companion fungus, known as mycorrhizae, to survive; this fungus is easily destroyed when the plant is dug up. The small white lady's-slipper (Cypripedium candidum) is an endangered orchid found in the wet meadows of the south block of the prairie Preserve. The population consists of a few thousand plants. Small white lady's-slippers grow in clumps, blooming briefly in late May to early June and then all but disappearing. The small white lady's-slipper cannot reproduce without the presence of a companion fungus, nor can the mature plants live without a symbiotic fungus found within its root system. Protected under Manitoba's Endangered Species and Ecosystems Act, it is unlawful to pick, dig or disturb the surroundings of the small white lady's-slippers or the western prairie fringed-orchid. The Preserve was established to protect and conserve the native species found there, so please do not pick, dig or collect any of the plants and animals. Protection alone is not enough to keep a prairie healthy. Idle or poorly managed grasslands are often invaded by native trees and shrubs or exotic weeds. Even some native grasses, when heavily grazed or left idle, can increase to the point where they crowd out desirable species and reduce the diversity of the community. Historically, grasslands were shaped by fire, drought and grazing by mammals and insects with seasonal periods of rest. Before settlers cleared the fields and ploughed firebreaks, the red buffalo, as the Plains Indians called wildfires, would range from horizon to horizon. For tall-grass prairie, these fires were far from a destructive force, but rather an important part of prairie ecology. Fire broke down dead and decaying vegetation, returning nutrients to the soil and giving the sun an opportunity to warm the ground in early spring. The growth of trees and shrubs, which invade the prairie, was slowed by fire. Prairie plants, with much of their energy stored in underground root systems, were better adapted to fire than the shrubby invaders with their energy stored in above-ground parts. Manitoba's Tall Grass Prairie Preserve hosts its annual Prairie Day event on the second Saturday of August at the Prairie Shore Interpretive Trail, located 3 kilometres east of Tolstoi on Provincial Road 209. Each year, special presentations highlight the unique prairie plants and animals that have adapted to the harsh prairie climate. Expert botanists, birders and entomologists are a few examples of the natural history topics covered at Prairie Day. Guided walks provide a little of the Preserve's history and identifies many of the exceptional wildflowers in bloom. Face painting, a scavenger hunt and other fun activities take place throughout the day. Admission for the day is $5.00 per adult and no charge for children. Activities will run from 10:00 a.m. to 3:30 p.m. There is an on-site canteen that will be open from 10:30 a.m. until 3:00 p.m. A barbecue lunch will be served from 11:30 a.m. to 2:00 p.m. – please note, only cash is accepted at this event. Picnic tables and rustic washrooms are also available on-site. Please bring a lawn chair, sunscreen and insect repellent. Trail conditions may be wet so rubber boots or a change of footwear is suggested. All Prairie Day activities will take place rain or shine. For more information on this event, please contact Manitoba Tall Grass Prairie Preserve staff at 204-425-3229 (mid-May to mid-September) or tgpphq@mymts.net (year round). The Mixed-grass Prairie Stewardship Project, under the CWHP, promotes agricultural activities and prairie management that incorporate wise land stewardship and biodiversity conservation. This project raises landowner awareness of the value of native grasslands and guides future management and stewardship activities by providing inventory information to focus conservation efforts. The project implements, monitors and evaluates sustainable prairie management techniques such as managed grazing, burning, brush mowing and invasive species control. 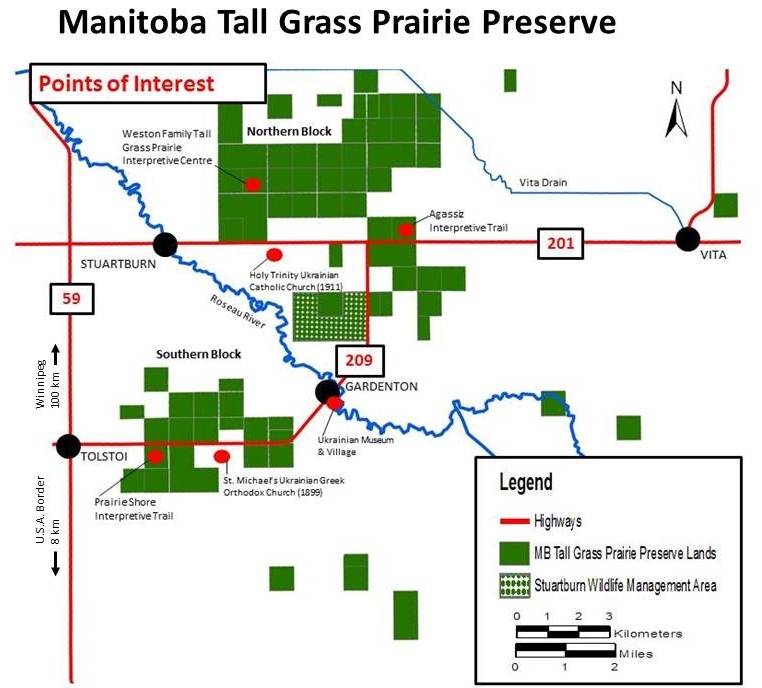 The CWHP has also embarked on an inventory (link to the new map called Mixed Grass Prairie Inventory Project) to identify and rank the remaining areas of mixed grass prairie in Manitoba. The Churchill SCA was created to protect Ross' Gull nests. St. Andrews Lock and Dam SCA was created to protect White Pelicans from getting caught by fishing hooks or entangled by fishing line. The other four SCAs were created to protect nesting Piping Plovers. No person shall enter a SCA where “Do Not Enter” signs are posted. The use of an off-road vehicle is prohibited in the Walter Cook SCA from April 24 to August 5. Off-road vehicles are prohibited in the Grand Marais and Sandy Bar SCAs from April 1 to September 15. This CWHP project is delivered in the Tall Grass Prairie Preserve area of southeastern Manitoba. This area is the largest intact natural tall-grass community in the province and contains several endangered and threatened species. Through a multi-agency partnership the Tall Grass Prairie Preserve Management Committee develops an annual work program that focuses management efforts for the area. The goal of this project is to ensure that the management done at the Preserve is effective in maintaining ecosystem viability as demonstrated through monitoring, and that the monitoring program is tracking the impacts of all major local and landscape-scale threats to species at risk. In August, the prairie is aglow with expanses of golden Indian grass,prairie cord grass, prairie dropseed and big bluestem. Hidden among the grasses are rare orchids: hooded ladies'-tresses bloom in early August while Great Plains ladies'-tresses flower a few weeks later. The blossoming of the gentians herald the start of autumn; the flowering of the closed gentian is one of the last colourful events on the prairie, often blooming until the harshest frosts. Soon the monarch butterflies will begin their fall migration to the southern United States and Mexico as yet another magical prairie season passes.